Ben Foss, Executive Director of Disability Rights Advocates, was a recent guest lecturer at Parents Education Network in San Francisco. This talk provided some advice for parents who are stymied by the schools systems when they are being an advocate for their child and his or her learning challenges. Mr. Foss is a dyslexic, a fact that was identified early in elementary school. His parents were his advocates with theresult of him being placed in special education classes. His nonverbal, picture-based intelligence was found to be in the superior range. His greatest difficulty was written language. In middle school he was mainstreamed into regular school classes where he was able to develop his strengths, all the while hiding his dyslexia. Law School pushed him to the breaking point. He could no longer hide the fact that he was dyslexic. Thus began a journey of self- discovery that ultimately led him to become an activist in the field of disability rights. Mr. Foss recommended five steps parents and their child can take with the school systems. It’s important to get a profile of your child. Engage your child and find out where their issues lie. Outline what are the approaches that give your child difficulties. Look for markers. Is the school too demanding for your child? Remember, your responsibility is to support your child, be your child’s advocate. State your goals to solve this issue. 1. Check to be sure the child wants to stay in the school. Engage the child on the child’s terms asking them what they want. 2. Sit with your child and teach them why a test is important. 3. Describe to your child how their attitude affects how well they will do in school work. 4. Teach them to stand up and be independent, speaking up for themselves. 5. Explore all forms of technology with your child to see where there is a tool that makes the child independent. Early in your child’s education process find out the requirements for the SAT, the nation’s most widely used college admission exam. While the date of that exam for your child may be ten years away, the documentation that you keep will have a major impact on the conditions under which your child takes this test. The goal is to serve the child while not having to engage the law in the process. While it’s important to have the law the goal is to resolve the issue without having to use the law force. Mr. Foss recommends you consider the law a bodyguard that never does anything but looks menacing. And, remember: document, document, document. Be an advocate for your child at the school. And, have your child learn how to advocate for themselves at school. Let them show the school administration and teachers that they want to become independent. As a parent, advocate for the accommodations you feel your child needs. Remember, your child wants to keep up with fellow students. That fact is very important to them. Accommodations can make that possible. Mr. Foss described his story about creating a device which made him independent. After Stanford Law School he joined Intel and created the Intel reader which takes text and reads it aloud. Now he could access the written word much more easily. Mr. Foss commented that there are many similar products now available. He said some kids resist using this machine because of their concern that they are not learning in the same way as their classmates. The goal is to help them see that they can learn faster with the technology. Sometimes this helps them overcome the embarrassment of using the machine. 5. Fine Tune your approach. 1. Remember: teachers don’t think about your child. Most just want the learning challenged kids to be sent to special education classes. This means the teacher will just have to deal with the “regular” student. Re-examine your strategy with your child. Make sure it includes discovering how to help them overcome their internal monologue that tells them they are the black sheep. If you ignore this behavior, it will stay with them. Parents must make overcoming this attitude part of your strategy with your child. There are two critical laws that protect students in education. Section 504 of the Rehabilitation Act of 1973. This law prohibits discrimination in ANY program that receives federal funding. the student must qualify under a “specific learning disability. Contained in IDEA is the IEP Plan, (individualized education plan) which states the education must meet the needs of each student’s unique learning strategies. Parents must request assessment for school evaluation in writing. Discussion of services (“placement”). There is a strong presumption in the law that students should learn alongside the general education students. Parents remember: document, document, document. Year after year be sure to have a folder with summaries of all the discussions and other pertinent information. You will need it when the S.A.T. time comes to get accommodations for your child. National Center for Learning Disabilities: “IDEA” parent guide. If you have taken or will take standardized tests: LSAT (for legal), GMAT (for medical) , and MCAT (for business), Disability Rights Advocates (DRA) is interested in speaking with you. They ask: Why must dyslexics pay thousands to re-certify on high stakes testing? If this project intrigues we suggest you contact DRA to find out more about their intentions and to help in their efforts to end this discriminatory practice eleonard@dralegalc.org or 510 665 8644. www.dralegal.org. In early January, 2011, Parents Education Network (PEN) held their annual workshop featuring five PEN students with learning challenges who have been successful in gaining acceptance to different colleges and universities throughout the US. All of them have one or more learning challenges including dyslexia, ADD and audio processing. The event was chaired by Eli Kersh-Oliva, program director for PEN which includes coordination of the SAFE Program*. He posed questions and the following summarizes some of panel experiences. Which colleges/universities are you attending? When did you decide you wanted to go to college? Things they considered when choosing a college. applied everywhere, was good advocate for myself, looked to see what fit me best, looked for a person who would invest time with me. looked for a small college and structured LD (learning difference) programs. took a gap year after high school and then chose a community college. I am not sure where I want to focus my education and need good learning support. I have a passion, fashion, and that propelled me to be interested in college. When did you disclose you had a learning difference? Wrote about it in my application and then weeded out schools who weren’t interested. Checked out LD resources and asked what accommodations they offer. During the application process I was worried about losing my parents support at home as I have to have everything read to me. I also use Kurtzweil, a speech reader software. I chose Whitman where the Dean told all my professors about my learning challenge. I wasn’t afraid of disclosing my learning difference. If they aren’t willing to both help me and give me accommodations then I knew it was not the right school for me. I went to a small school before Mills to gain confidence that I could be an advocate for myself. Then, I was ready to apply to Mills. I mentioned my learning difference in my application. At Iowa State they are very helpful and take the extra step to be sure I am successful. What special technology do you use and/or how did you build community at school? I use Kurtzweil, they gave me double time for an exam which I take in another room and am given a calculator. I have available through the college an I-Pod, Kindle, Intel Reader and Pens that record what is being taught. At college we created community: Learning Styles Coalition. We are involved in Project Eye to Eye, a national program developing a coalition of mentoring programs for students labeled with learning disabilities. Now, fifteen of us are mentoring in the Walla Walla Schools. I am in a large university (USC) and they have an extensive learning department. Every class has a note taker and their notes are put on-line. We have a silent commons where kids who have learning disabilities can go twenty-four hours a day. Right next to it is the Writing Center where there are TA (technical assistants) in many fields to help us. I get help with grammar from them. At Mills there is a large population with learning disabilities. I feel very comfortable talking about my issues. At my community college there is very little LD community. My friends who are LD and ADHD are my friends and we help each other. I get extra time and I take classes (like sewing) to balance the academic work. There isn’t much community, except with my friends. What are the differences between high school and college? Time management is a big issue. In school we were in class from 8:15 to 4 pm. In college we may have only two classes a day. I had to find a place where I could study. And, I really learned to be a self advocate. My Mum did most of that in high school. At the beginning of each semester I offer to take my professors to coffee and tell them about my learning difference and what I need. In high school I had close relationships with my teachers. In college if you fail he won’t be there for you. It’s up to you in college. It’s very important to get the teacher in line with you. Make sure they know your name and that you are trying. In high school there was very little curriculum choice whereas in college you choose what you want to study. It’s very important to be passionate about what you choose to learn. In college you have to take the entire experience in your hands. Parents absence is a big change. Those struggles makes you stronger, a better advocate for yourself. A planner is essential. Write it all down. In college you are a face in the crowd. To achieve you need to know the things you are good at and vice versa. College can be a big change. I learned you have to go to office hours and talk about the test with the professors. You can raise your grade by keeping in close contact with your professor. And, be sure to get a reader if you need one. Communicating in college with your class mates is very important. Find people who study like you do. Think back to your freshman year, what stands out as most important? child to be a self advocate? Take a light load in the 1st semester. It’s a lot just to start college. Make sure the professor cares about you. What did your family do for you when you were in school? I started to do panels in grade 7. I did role playing with others to learn how to be a self advocate. My parents called a teacher to tell them that I was coming to ask for something and asked that they give me space and listen to my request. I learned to advocate for myself. I was the black sheep of the family. I never took my parents seriously. I learned by being in a LD community. Safe Voices, a project of PEN, taught me how to advocate. Self advocacy is the key. Check out who is the person in each class who sits in the front row. They are generally a “know it all”. Get into their study group. I don’t always disclose about my learning challenge at the outset with those groups. If there is a creative aspect I ask to do that. Professors can be creepy. They have brains but mostly no facial expressions. So get to know them. If they deny you what you need, go to the administration and ask for intervention. Before you go, send the professor an e-mail with the request. Once you have the denial written down, take it to the administration and ask for intervention. That ends that. Remember it’s your right to have accommodations. Parents: let your kids make mistakes. Students: have a good time at college, don ‘t study all the time. Don’t let parents affect your thinking so that you lose your perspective. Make friends with those who have similar study patterns. In high school I was lost and only thought about girls. In college I found my passion. Don’t worry about motivation, find the passion. Gap year is a good way to become re-invigorated. their fullest potential and spreading awareness of their capacity for academic and life success. 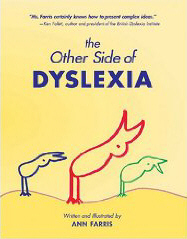 This blog is written by Ann Farris, a dyslexic/hyperlexic. In early December PEN (Parents Education Network) hosted two speakers from the Abbey Neuropsychology Clinic, Richard D. Abbey, Ph.D., Clinical Neuropsychologist and Diana Barrett, Ph.D., Clinical Psychologist. Their focus was three complex issues: Depression, Anxiety and Learning. I was impressed with the ease that these two specialists shared the podium as they imparted their expertise. A more detailed background on both speakers can be found at the conclusion of this blog. They began their morning talk with a focus on depression, advising us that it appears differently with children and adults. For a child, irritability is a key element. They become very edgy and display a lack of interest in something that they previously very much enjoyed, walking away from any involvement with it or others. Whereas a tip the speakers provided to indicate whether an adolescent might be in a depressed state is sleeping till noon or complaining about a tummy ache. These are safer ways for an adolescent to express depression. If there evolves a pre-occupation with poetry whose topic is life threatening, it could mean the adolescent is exploring the possibility. The challenge for a parent is discovering whether the comments are simply anxiety which interferes with a child’s functioning or whether the issue comes from a depressed state. Often depression comes when there is a problem with learning. This causes emotional issues. Ask yourself the question: are the emotional issues out of control? Or is depression causing a learning problem? It is clear that when a child, adolescent or adult is depressed, this state interferes with other and important daily functions. The frontal lobe of the brain is where Executive Functioning (ie: skill building) occurs. It can be one of the first segments of the brain affected by depression or anxiety. Kids who can’t keep information being taught in their mind are offering a good clue that this skill is not working well. Perhaps the school teachers are unable to track the child’s reading skills which can result in their teaching approach not matching the way the child learns. When a student hears from a teacher: “try a little harder” or, “we just told you” when they are not doing what is being asked, more than likely the child/adolescent internalizes, “I am stupid.” This can lead to depression. There is another clue: Is the student taking a long time to accomplish a task, especially if there is sequence of tasks to accomplish with the project. This inability can lead to the student getting caught up in right and wrong. And, then they begin to say to themselves if I can’t do it perfectly I am not going to do it at all. Their anxiety becomes dominant. 1. Is anything significantly different in any domain of your child’s life? 2. Is their day to day functioning different from the norm? 4. With Executive Functioning: is there a switching of letters and numbers? Can they sort out a lot of information being taught? does their attention keep varying? 5. Are you concerned that your child may not be safe? There are solutions/interventions to these tell tale signs: A few are listed below. 1. Professional emotional and learning assessments to diagnose what is happening with your child. 2. Cognitive Behavior Therapy. The process focuses on solving problems concerning dysfunctional emotions, behaviors and cognitions: I looked up the word “cognitive” on Wikipedia for a definition. It refers to the following skills: attention, remembering, producing and understanding language, solving problems, and making decisions. The speakers had some good news about the effectiveness of Cognitive Behavior Therapy confirming that 75% of the time there is some kind of improvement with anxiety and depression. 3. Medications: The speakers did not spend much time on this topic. They did comment that kids on medication do seem to have a working memory problem. This is a controversial issue which has been discussed at PEN many times. See former PEN and Emotion blogs within my various blogs for more information. 3. Reading interventions. The speakers cautioned parents to undertake due diligence before taking action. Some therapies only look at a part of the problem – which may or may not be appropriate for your child. For an overview the speakers recommend using the National Reading Panel. http://www.nationalreadingpanel.org. how to plan, how to live with goal oriented behavior. 5. Software: These speakers were promoting the use of a Pulse Pen. It records what is being said and relieves the need for the listener to take notes. They also mentioned the Intel Reader which was discussed in more detail in the previous PEN blog. 7. What to do at home: Adjust expectations of your child: Set realistic goals. schedule free time along with time with you, the parent. Have a listening ear, find a way to bring up the topic you want to discuss or to hear more about from them. 8 School: School placement is very important. See previous PEN blogs on this topic. These speakers gave me a giggle when they said: We have never spoken to a parent who didn’t think that they were right. A part of me, Ann, who is writing this blog and is not a parent, sees that part of needing to be right in myself. It takes time to undo that belief. If you, as parent are so challenged, give yourself time to learn more about the topic. Yes, I know sometimes that’s a difficult step for a parent to take. Our ego can make it difficult for us to accept there is a learning challenge. Your goal is to keep the best interests of the child to the fore. Here’s a sobering comment made by the speakers. There is evidence now that if one parent experiences depression, the risk for the child developing depression goes up. So, if you as parent experience the same issues as the child, the speakers said it helps the child if the parents also do the interventions. The speakers urged the parents to go to gatherings, like EdRev in San Francisco, a yearly event produced by PEN which occurs at the Giant’s Baseball Park. Here parents can intermingle with hundreds of other parents and learning specialists and Depression, ansietydiscover ways to increase their knowledge base on the issues facing their child. Remember, the brain is neuroplastic, it can and does change! Dr.Richard Abbey is a clinical neuropsychologist who specializes in assessment, diagnosis, and treatment of ADHD, learning disorders, and other neurocognitive and emotional conditions. Prior to opening the Abbey Neuropsychology Clinic in Palo Alto, Dr. Abbey was a clinical faculty member at Stanford University School of Medicine/Lucille Packard Hospital. His areas of specialty include ADHD (and non-medication based interventions for ADHD), learning disorders, pediatric brain tumors, autism, and treatment of neurocognitive deficits. Diana Marchetti Barret, Ph.D. is a clinical psychologist who assesses and diagnoses learning disorders, developmental disorders (e.g. autism, aspergers), mood disorders, and ADHD. Dr. Barrett completed post-graduate work at the University of Utah Neuropsychiatric Institute and post doctorate training at Stanford University School of Medicine, Child and Adolescent Psychiatry. Dr. Barrett also has specialty training in Motivational Interviewing, Dialectical Behavior Therapy, non-medication treatment for ADHD, and Pivotal Response Training (PRT) for Autism Spectrum Disorders.